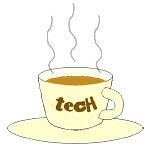 business « Tech bytes for tea? Gojek has beta-launched its ride-hailing app service in Singapore. Here are answers from Gojek to some frequently asked questions on the gradual rollout. Gojek President, Andre Soelistyo (left) and Global Head of Transport, Raditya Wibowo. Eager to try out the competitor to Grab? Here are some FAQs about the beta-launch in Singapore of the ride-hailing app. Can you share more about the process of waitlisting? Waitlisting is the process of giving riders access to Gojek’s ride-hailing service. What are the areas in Singapore covered in the beta launch? 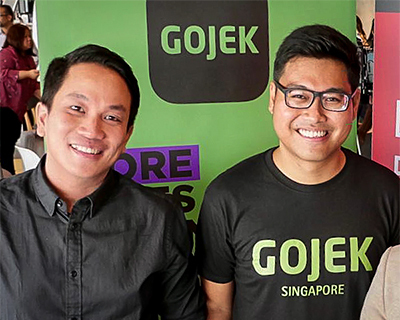 During the beta launch, Gojek’s service areas will cover more than half of Singapore, including the Central Business District, Jurong East, Changi, Punggol, Ang Mo Kio and Sentosa. We fully intend to serve the whole island and will progressively expand our coverage throughout the beta phase. Why start with these areas? Gojek’s service areas during the beta launch are chosen based on population density, and limited initially to better manage supply and demand. It is on a first-come, first-served basis. Riders will have to download the Gojek app and sign up for an account. They will be placed on a waitlist and receive an email or push notification once they have been given access to the service. DBS cardmembers can enjoy priority access on the waitlist by entering an access code during registration. The code is “DBS” followed by the first 6 digits of their Visa, Mastercard or AMEX card (eg, “DBS123456”). More details for DBS/POSB cardholders can be found here. I’ve previously used Gojek in Indonesia. Do I need to register again? If you have previously registered with Gojek, there is no need to register again. Gojek will let you know on your next steps. Consumers in Singapore will get to try Gojek’s ride-hailing service with the launch of the beta version of its app, which will be made available for download from iOS and Android app stores in Singapore today. GOJEK will be extending its ride-hailing services to the whole of Singapore from tomorrow, January 2, 2019. The following is the press statement from GOJEK. “Following our successful limited service area rollout, GOJEK is excited to announce that we will extend our ride-hailing services to the whole of Singapore with effect from January 2, 2019. This means that users will be able to use GOJEK to take rides anywhere in Singapore. Our island-wide rollout is part of our continued beta phase, during which DBS/POSB Bank customers continue to enjoy priority access to the app. (From left) Gojek President, Andre Soelistyo; Gojek’s Global Head of Transport, Raditya Wibowo; Shee Tse Koon, Group Head of Strategy and Planning, DBS Bank; and Gene Wong, Head of Ecosystems, Consumer Banking Group, DBS Bank. This marks the start of a gradual roll-out of Gojek’s ride-hailing services across the island as more driver-partners are onboarded over time to feed consumer demand. “It is with great pride that we begin the roll-out of our services in Singapore. Consumers throughout the country have told us that they want more choice in this sector and with the launch of our beta app, their wait is coming to an end. We are launching in beta for now, while we fine-tune our service to make sure it meets the high standards expected by Singaporeans. 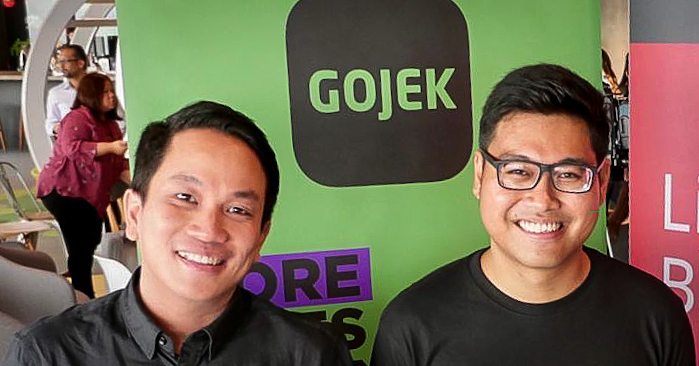 As such, we are asking all users, whether drivers or passengers, to provide us with ongoing feedback as we work towards creating the best possible service for the country,” said Gojek President, Andre Soelistyo. This staggered approach reflects Gojek’s commitment to ensuring a smooth entry into Singapore and an ongoing effort to improve user experience over time. An FAQ on Gojek’s beta service can be found here. 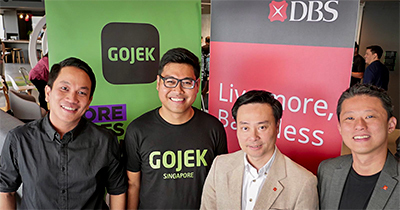 The launch of Gojek’s beta app in Singapore kickstarts the regional strategic partnership between Gojek and DBS, two of Southeast Asia’s most iconic companies. DBS/POSB customers in Singapore will be the first to enjoy Gojek rides during the beta phase. During the beta phase, access to the app will be granted in batches to balance ride demand and service capabilities. DBS/POSB customers in Singapore will be guided by the app to find out how they can be prioritised on the waitlist, and receive a SGD 5 voucher credit for each of their first two rides. 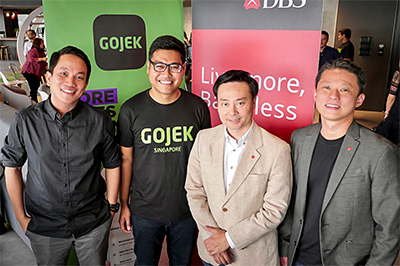 DBS Bank and Go-Jek today announced that the two parties have entered into a regional strategic partnership. Hear views from both companies below. 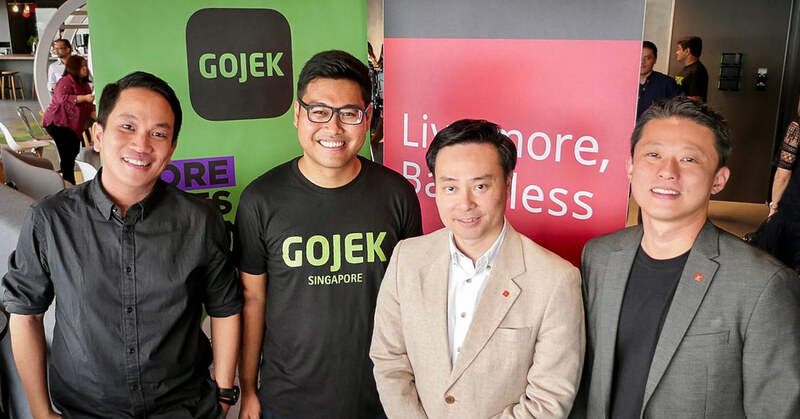 (From left) Go-Jek President, Andre Soelistyo; Go-Jek’s Global Head of Transport, Raditya Wibowo; Shee Tse Koon, Group Head of Strategy and Planning, DBS Bank; and Gene Wong, Head of Ecosystems, Consumer Banking Group, DBS Bank. The partnership will see the two companies work together on payment services ahead of Go-Jek’s arrival in Singapore and this will soon extend to other countries in Southeast Asia. “As Singapore’s leader in payments with over four million debit/credit cards in circulation and DBS PayLah! being the nation’s most popular mobile wallet, we are committed to making payments simple, seamless and invisible for our customers. In doing so we are stepping up to partner with like-minded companies like Go-Jek, one of Southeast Asia’s most iconic technology companies, to build inclusive digital ecosystems for our customers,” said Tan Su Shan, Group Head of Consumer Banking & Wealth Management, DBS Bank. Go-Jek, whose investors include Google, Temasek, Tencent and Meituan Dianping, is set to launch its beta ride-hailing app in Singapore within the coming weeks and as part of this, DBS customers in Singapore will enjoy a slew of exciting privileges. What kind of privileges can DBS/POSB consumers expect? DBS/POSB customers in Singapore will be the first to be able to book rides during the beta phase. Other privileges include an exclusive SGD 10 voucher credit which riders can use for their first two trips (SGD 5 per trip), and future discounts on Go-Jek’s ride-hailing service in the form of promo codes. Panasonic claims the 14-inch Toughbook CF-LX3 is the lightest device of its kind for everyday mobile business computing. Available in Singapore now from S$2,499. The Panasonic Toughbook CF-LX3 has an uneven “bonnet” design on the surface of its magnesium alloy cover for greater strength. The Panasonic Toughbook CF-LX3 is targeted at mobile business professionals combining functionality and portability in a light-weight, shock-resistant body. By 2015, Panasonic expects the world’s mobile worker population to represent up to 37.2 percent of the total workforce with Asia Pacific (excluding Japan) seeing the largest increase in the total of mobile workers. With up to 14 hours of battery life, Windows 8.1 Pro, Intel Core i5 vPro processor, built in optical drive, and weighing just 1.29kg, the Toughbook CF-LX3 combines premium performance with a light, durable, and ultra-sleek design. Panasonic claims the 7-inch Windows 8.1 Pro fully-rugged tablet is the lightest and thinnest device of its kind . Available in March 2014. Price TBA. Panasonic has launched the Toughpad FZ-M1 tablet (together with the Toughbook CF-LX3) in Singapore. It will be available in March 2014 at S$2,600. The Panasonic Toughpad FZ-M1 fully rugged 7-inch Windows 8.1 Pro tablet offers power, flexibility and durability for maximum mobile workforce productivity. Panasonic introduced during 2014 International CES the latest member of its Toughpad family of rugged, enterprise-grade tablets. The Toughpad FZ-M1 is designed to improve productivity and efficiency in a host of professional scenarios. These include customer service, inventory management and asset tracking, maintenance, eForms, route delivery, eCitations, electronic medical records, inspections, mobile point-of-sales and Geographic Information System. The tablet runs Windows 8.1 Pro, on an Intel Core i5 processor, making it easy to integrate into enterprise and government environments. The Toughpad FZ-M1 has multiple configuration options enabling it to be customised to meet the unique needs of mobile users in various markets such as field services and sales, retail, supply chain and logistics and government. The Fujitsu LIFEBOOK UH554 (S$1,488) and UH574 (S$1,888) are slim bodied but full-featured, aiming to be a versatile and responsive work partner. Prices include GST. From Left – Fujitsu LIFEBOOK UH554 and LIFEBOOK UH574. The Fujitsu LIFEBOOK U Series caters to all of the user’s computing needs. “The LIFEBOOK U Series offers user-friendly features, functionality and mobility designed to optimise and enhance your everyday computing use and performance.” Lim Teck Sin, Vice President, Engineering and Product Marketing, Fujitsu PC Asia Pacific. It is packed with all the functions necessary for work, school or play. The LIFEBOOK UH554 and LIFEBOOK UH574 come with an ultra-responsive touch panel, Intel Wireless Display (Intel WiDi), long battery life, advanced security features to keep data protected, and is powered by new generation Intel Core Processor for well-rounded performance. Fujitsu today unveiled its slimmest business notebooks: LIFEBOOK E753, 743, and E733. Available from June 2013. From Left – Fujitsu LIFEBOOK E753, LIFEBOOK E743 and LIFEBOOK E733. Built with maximum durability and security for business travellers, the latest LIFEBOOK E Series notebooks are equipped with the latest 3rd Generation Intel Core processors up to i7. “Our customers are embracing mobility in their everyday corporate lives and Fujitsu understands this paradigm shift,” said Mr. Lim Teck Sin, Vice President, Product Marketing & Engineering, Fujitsu PC Asia Pacific Pte Ltd. They also sport the Mobile Intel QM77 chipset with vPro supported. The LIFEBOOK E753 with its slim form factor features a brilliant 15.6” display, a variety of interfaces and high-end security features for ultimate work efficiency. LIFEBOOK E743 comes with a 14” display and weighs only 1.9kg, offering greater convenience in the office. The LIFEBOOK E733 comes with the right balance of portability and functionality featuring a 13.3” display and weighs a mere 1.7kg. Full-fledged features packed into its small form factor makes it the ultimate choice for business individuals on-the-go. Here are some 0ptional accessories that add to the usability and connectivity of the HP ElitePad 900 tablet. HP ElitePad 900 with an HP Slim Bluetooth Keyboard (S$89) and Docking Station (S$219). HP ElitePad Productivity Jacket (S$339) — includes an integrated keyboard, connectivity ports, SD card reader and adjustable viewing angles for a complete computing experience. HP ElitePad Docking Station serves as a stand and provides additional connection ports for the tablet. These include 3 x USB 2.0, 1 x Poweed USB 2.0, 1 x Combo stereo/headphone jack, 1 x HDMI, 1 x VGA, 1 x RJ-45, and 1 x Smart AC adapter. HP ElitePad Expansion Jacket (S$189) — adds USB, HDMI and other connectivity to get more done on the go. Adds even longer battery life when bundled with the optional HP ElitePad Jacket battery (S$279 for Expansion Jacket with Battery) . The HP ElitePad Rugged Case (S$99) — provides military-grade reliability and enhances the stylish profile of the ElitePad for added protection. HP ElitePad Docking Station (S$219) — delivers an enterprise-class desktop experience with an added keyboard and monitor and also charges the tablet. Or, use it to set the tablet up as a secondary screen for phenomenal multitasking. HP Executive Tablet Pen — lets customers write messages and notes in their natural handwriting directly on screen and then save or convert to typed text for use in other applications. Designed specially for business and government use, HP ElitePad 900 is a 10.1 tablet running on Windows 8. SRP: S$1,099 (incl GST) for 32GB eMMC SSD and S$1,299 (incl GST) for 64GB eMMC SSD. For S$199 more, HSPA+ versions are also available for mobile broadband connectivity. The HP ElitePad 900 is a tablet designed for businesses, with a 10.1 inch diagonal screen and a range of accessories. I first saw the ElitePad 900 as a prototype back in October last year. Half a year later, the tablet is now available in Singapore. ElitePad 900 offers the full serviceability, enhanced security and manageability found in HP Elite PCs, and military-grade durability for drops, vibration, dust, temperature extremes and high altitude. Optional accessories add to the usability and connectivity of the ElitePad 900.